This picture, courtesy of Alain Chautems, shows Vanhouttea leonii in habitat. It appears we should be growing our vanhoutteas in the crevices of rocky outcrops, surrounded by plenty of weeds. The rocks may allow the plant to get plenty of sunlight while protecting the roots from drying out too much. This picture shows a seedling, started from Brazil Plants seed. 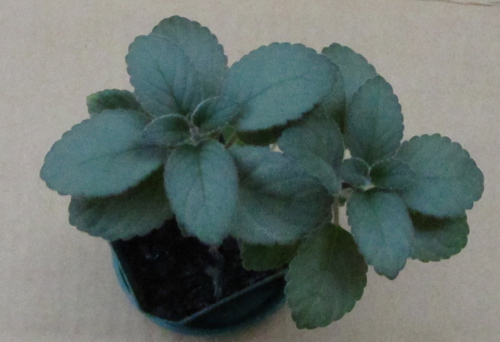 At this time [September 2013], the plant was about 14 cm [5.5 inches] tall, and growing in a 3-inch pot. Vanhouttea leonii, at least under my conditions, seems to be shrubbier and more compact than other vanhoutteas. Mauro Peixoto believes that my plant may be a natural hybrid of the true Vanhouttea leonii and Vanhouttea pendula, which grows not to far from V. leonii. He bases this mostly on the corolla color, which differs a little from that of the parent plant (from where the seeds that I sowed were gathered). Arguing against this is the shortness of the corolla on my plant (only 3 cm, while V. pendula corollas are 4 cm or more longer) and the corollas on my plant being held horizontally (as opposed to pendant on Vanhouttea pendula). Leaves Green on top, back paler. Flower Tubular, orange, red, or maroon, about 3 cm [just over 1 inch] long (smaller than other vanhoutteas). Red striping on corolla interior. Hardiness My plant has survived 32 F [0 C]. Germination Fresh seed germinated in ten days. From seed Two and a half years to first flower. Plant grew much better outdoors. With better horticulture, probably would have bloomed sooner. Recommended? Yes, provisionally. So far, it has not bloomed heavily and the flowers are small. On the other hand, the habit is compact. Both foliage and flowers are attractive. Taxonomic group The free-calyx-lobe vanhouttea clade. 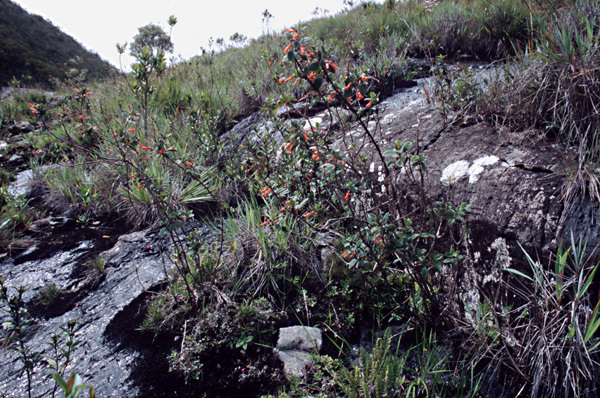 Habitat Eastern uplands of Minas Gerais, Brazil, above the tree line. Mauro Peixoto's web site has a page about Vanhouttea leonii. 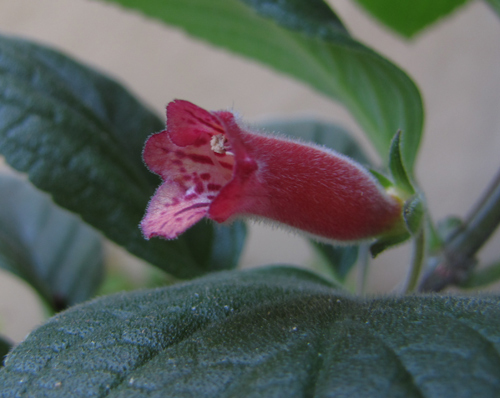 The species V. leonii was described in Alain Chautems's paper "New Gesneriaceae from Minas Gerais" (2002). It grows in Minas Gerais state of Brazil, in the same general area as V. pendula: the mountains near where the three states of Minas Gerais, Espírito Santo, and Rio de Janeiro meet.